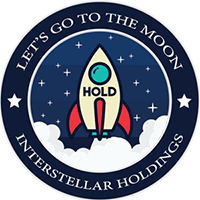 Interstellar Holdings trades under the symbol "HOLD" and runs without the need of a central bank or single administration. Interstellar Holdings, a crypto coin, uses the Scrypt algorithm along with the proof of stake (pos) consensus. We don't have any cloud miners listed for Interstellar Holdings yet, check back soon! We don't have any exchanges listed for Interstellar Holdings yet, check back soon! We don't have any wallets listed for Interstellar Holdings yet, check back soon! We don't have any debit cards listed for Interstellar Holdings (HOLD) yet, check back soon! We don't have any price charts listed for Interstellar Holdings yet, check back soon!